Firing a fresh salvo at the opposition parties, Prime Minister Narendra Modi Friday accused them of indulging in petty politics that is benefiting the enemy and said their only agenda was to "remove Modi" rather than focusing on the country's growth. 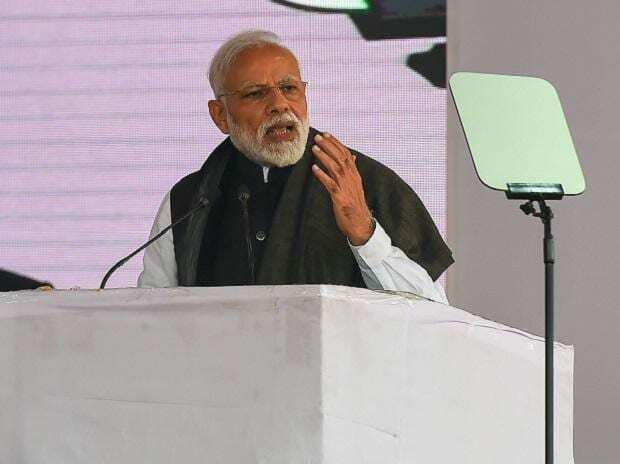 "It is the country's misfortune during this time when the whole world is seeking ansewers from Pakistan, some in India are giving statements that will weaken the morale of the country's security forces," Modi said, addressing a rally organised by the BJP here. "They should introspect what they are talking that is being lauded in Pakistan Parliament and used to target India," he said in an apparent reference to ongoing tensions between the two countries following the February 26 air strikes by the Indian Air Force and Pakistan capturing an IAF pilot the next day. "Why are the parties of mahamilavat (highly adulterated) indulging in petty politics that is benefiting the enemy. In their hatred for Modi, they have started hating the country," Modi charged. Training his guns against his political opponents, Modi said they were keen on removing him because he had ushered in positive change in the lives of the poor, farmers and the oppressed. "They also want to remove Modi because he is initiating action against touts and agents. Rather than having any agenda for the (growth of the) country, they are keen on only removing Modi," the prime minister said. However, people have understood the agenda of the 'Mahamilavat' (highly adulterated), Modi said alluding to the to the proposed 'Mahagathbandhan' or grand alliance. Their efforts to form a 'mazboor'(weak) government will not yield result as the country was witnessing the work of a 'mazboot' (strong) government, Modi said. Highlighting the Centre's commitment for Andhra Pradesh's development, Modi said the NDA government's decision to create a South Coast Railway Zone headquartered here is ample proof of that. Visakhapatnam was a 'dream city' of Andhra youth and the Centre had accorded priority to fulfil their aspirations, Modi said. "Today I have come here with a good news. The government has taken a proactive step on a long pending demand. Centre has decided to create South Coast railway zone with Visakhapatnam as its headquarters," Modi said. This was as per the Andhra Pradesh Reorganisation Act, 2014, he said. Other initiatives for the state included upgradation of the local airport, an IIT, Indian Institute of Petroleum and Energy, ESIC super speciality hospital and creating oil reserve facilities, the prime minister said. The 'pradhan sevak' (principal worker) was totally dedicated for the development of the state and the NDA was doing it with full vigour and honesty as "there is no baggage on us," Modi said. "We have no fear of what will happen if some file is opened. Only those who had sinned will be afraid. This fear is consuming our rivals, among who are those trying to establish a dynasty," he said without naming anyone. In an apparent reference to Naidu, he called him an "expert in U-turn," and said had he fulfilled the promises made by him, he could not have had to blame the Prime Minister for his follies. "He (Naidu) is hobnobbing with those who spared no efforts to hurt Andhra's pride," Modi said in an apparent reference to the TDP leader's aligning with the Congress. Ahead of the Lok Sabha and state assembly polls, Modi has been training his guns against Naidu, seeking to remind him that the Telugu Desam Party founder, the late NT Ramarao, had founded the very party against the Congress. Modi also said those who have to ensure the progress of sons and daughters of Andhra Pradesh were doing it for their own sons and daughters, seen as yet another jibe directed at Naidu. In a letter to the Prime Minister on the eve of his scheduled visit to the port city, Naidu had asked Modi if he was not ashamed to visit the state with 'empty hands', saying he owed an explanation to 'five crore people' over unfulfilled promises,vis-a-vis the AP Reorganisation Act,2014. Citing the recently rolled out PM-Kisan scheme and the income tax exemption announced in this year's budget, Modi reaffirmed his government's commitment for the people. Various initiatives in the port sector, for fishermen and others had also put the country on the path of growth, Modi said. He said "big decisions" have been possible with the same set of officialdom and credited it to the strong mandate given by the people in the 2014 Lok Sabha polls and urged the voters to give him a stronger mandate this time. In the national interest, "determined and big decisions" were being taken and "New India's rules are changing," the Prime Minister added. Earlier, after arriving at INS Dega from Kanyakumari in Tamil Nadu, the Prime Minister drove straight to the meeting venue even as the ruling Telugu Desam Party organised protests in the city against his visit. A drizzle did not deter the large crowd that assembled for the 'Praia Chaitanya' rally organised by the BJP at the railway grounds here. A torch rally was taken out by TDP workers here denouncing the establishment of a new South Coast Railway zone by splitting the existing Waltair Division. This is Modis second visit to the state after the first one to Guntur on February 10, where he addressed a public meeting.